At Telford Group Ltd we are proud to offer welder training from basic start up to advanced level. 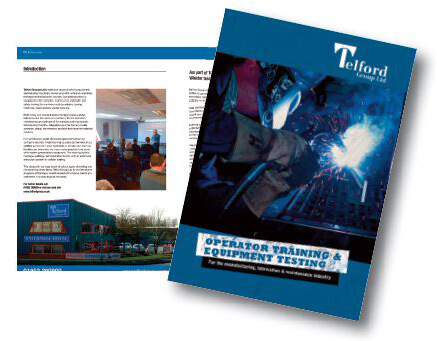 Telford Group Ltd provide welder training and approval testing either at the clients premises providing they have suitable facilities and welding equipment of a suitable type and in good working condition or at our own welder training school on Stafford Park in Telford. We offer qualified personnel supplying welder training & testing welder coding to include job knowledge. This can be specifically designed to suit you or your organisation, ensuring you or every member of your staff develops the skills to carry out welding tasks competently and to the required standard, thus satisfying both your customers and insurance company. Welding can often be seen a daunting process to under take. At Telford Group Ltd we can also offer basic welder training for people who've never even welded before. Our training staff will take you through the operation and safety aspects of the welding process and the various types of machine, then provide practical training on various types of materials or applications common to your industry. If there is a certain type of welding or part of the process you wish to improve on, a training course can be tailored to you or your staffs needs. When a machine is purchased and you choose to collect from our Telford depot, we can offer to assemble the machine, set it up and then provide training and tuition on the machines setup, operation and functions, so you, the new owner are ready to use the machine to its full potential. ANNUAL CP7 INDUSTRIAL GAS & EQUIPMENT INSPECTIONS. TESTING AND SERVICING OF WELDING FUME EXTRACTION AND LOCAL EXHAUST VENTILATION (LEV) SYSTEMS. PAT OF POWER TOOLS, MACHINERY ETC ON OR OFF SITE. At Telford Group Ltd we can offer basic welder training for people who've never even welded before, Our training staff will take you through the operation and safety aspects of the welding process and the various types of machine, and then provide practical training on various types of materials or applications. This half day training course is aimed at anyone who selects, mounts or uses abrasive wheels. The course covers different types of abrasive wheel, pre-use inspection to wheels and tools, hazards, correct PPE, fire control, regulations, correct cutting/grinding techniques and correct selection of wheels. THE ROLE OF RESPONSIBLE WELDING COORDINATOR (RWC) IS TO ENSURE THAT ALL WELDING OPERATIONS CARRIED OUT UNDER HIS / HER CONTROL. THESE DUTIES ARE CARRIED OUT IN A MANNER WHICH MEET THE REQUIREMENTS OF THE APPLICATION STANDARDS AND / OR CONTRACT REQUIREMENTS. Telford Group Ltd is a registered Approved Centre for carrying out the witnessing of permanent joining on behalf of Zurich (see a copy of our approval certificate below). These witnessing services include witnessing for both the initial Weld Procedure Qualification testing and also for subsequent Welder Approval testing for individual Welder Qualifications to said procedures. On completion, the test pieces are then sent to Zurich's Laboratory for Testing in accordance with the appropriate ISO or ASME standard and the results are reported back by Zurich on ISO 17020/17025 compliant certification. To view our certificate please click here.